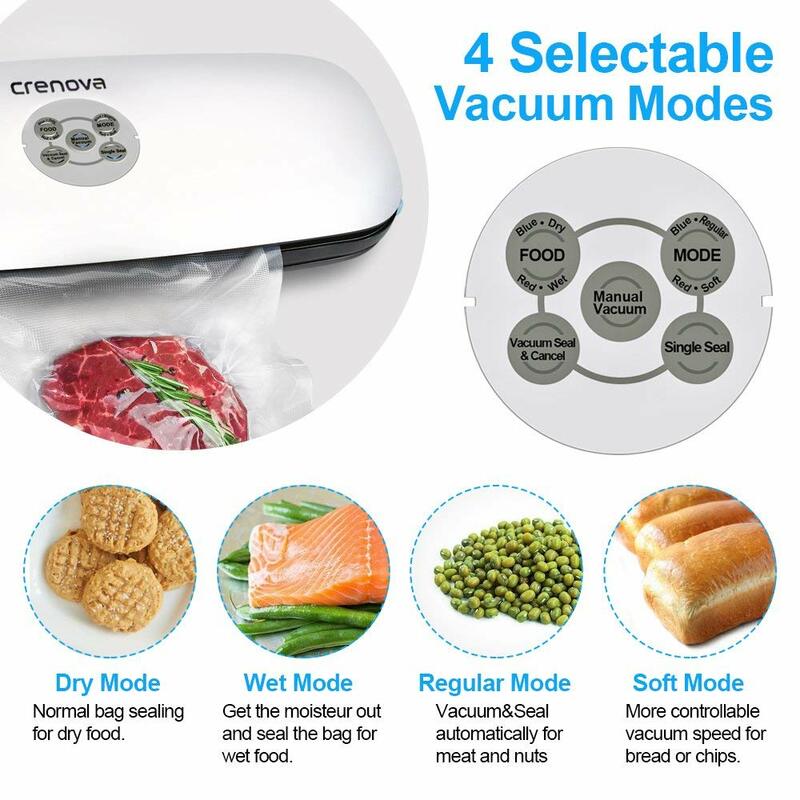 Crenova V60 Plus Vacuum Sealer, 3-in-1 Automatic Food Sealer Saver with Starter Kit of Cutter，10 Vacuum Bags/Rolls for Dry&Moist Food Preservation Saver. With a built-in cutting knife, you can slide it smoothly to cut the right length of bags you desired, especially practicable for a sealer roll. Effortlessly select Dry, Moist, Soft or Delicate Mode for perfect sealing, multi-modes allow you to preserve and prepare a wide variety of foods and personal items. “Seal Only” button works well with chips bags. 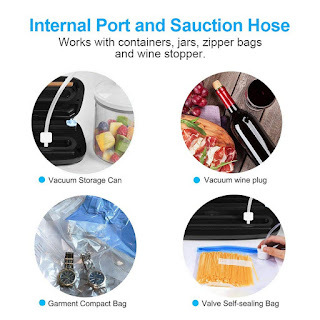 “Vacuum & Seal” button will get the job done automatically in a few minutes. “Cancel” button is designed to stop the appliance and ensure your safety. Compact size & light weight make it easy to store on a shallow shelf. The bright LED indicators of power status and button operations are convenient for use. This food sealer comes with everything you need to get started, including 1 air suction hose, 5 medium vacuum bags (7.8” x 11.8”), 5 large bags (11” x 12.5”) and 1 extra-long vacuum bag roll (7.8” x 80’’). 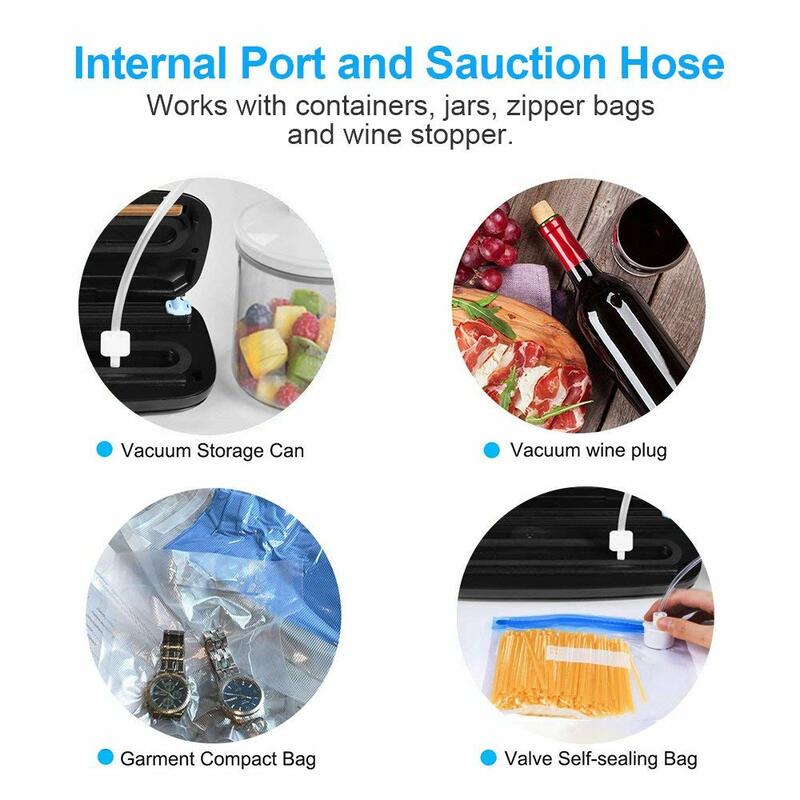 My Opinion: I like all the options in how the vacuuming is done and the bag cutter, lift the front part of the bar to slip your bag in and it's so easy. No more wavy cut lines with scissors! I did compare the Crenova to my dad’s food saver machine and this one is a little bit smaller and takes up less room.